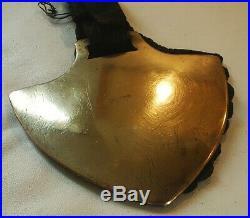 A VERY RARE 19TH CENTURY SPADE SHAPE HORSE BRASS ON LEATHER. A very rare solid spade shape cast brass, circa 1890. Lovely harness wear and patina. In good condition, but with some surface marks, scratches. On it’s original leather face piece. The top strap has split and is wired together but is still fine for display. Size 8 x 4.75 inches. Both of my horse brass collectors handbooks are for sale, please see my other listings. If you are looking for any brass not listed then please message me, I will be pleased to list your requests. The item “A VERY RARE 19TH CENTURY SPADE SHAPE HORSE BRASS ON LEATHER” is in sale since Tuesday, April 2, 2019. 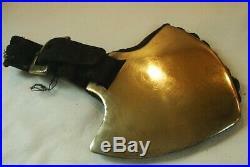 This item is in the category “Collectables\Metalware\Brass\Horse Brasses”. 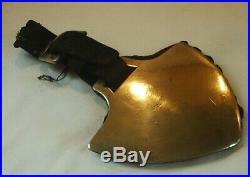 The seller is “saddler1986″ and is located in Sutton Coldfield. This item can be shipped worldwide. ← Davis Schuman Model 16 S Angular Trombone Professional Model Very Rare!